Alonso, C.; Aguilar, A.; Coch, H.; Isalgue, A. As it is known, the energy consumption of buildings is directly linked to their energy demand.Therefore, the most direct strategy to reduce the energy consumption of a building is to minimise its energy demand. This can be done in two ways. On the one hand, the energy demand can be reduced by minimising the size of some energy consuming spaces in the building. It can also be reduced by minimising the requirements of their comfort conditions. This second strategy is especially effective in transitional spaces, where the comfort requirements have wider limits than in normally occupied zones so energy savings are possible by allowing for a modest relaxation of the comfort standards. 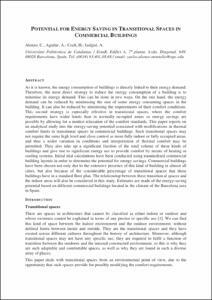 This paper reports on an analytical study into the energy-saving potential associated with modifications in thermal comfort limits in transitional spaces in commercial buildings. Such transitional spaces may not require the same high level and close control as more fully indoor or fully occupied areas, and thus a wider variation in conditions and interpretation of thermal comfort may be permitted. They also take up a significant fraction of the total volume of these kinds of buildings and give rise to significant energy use to provide comfort by means of heating or cooling systems. Initial trial calculations have been conducted using standardised commercial building layouts in order to determine the potential for energy savings. Commercial buildings have been chosen not only due to the extensive presence of this kind of building in almost all cities, but also because of the considerable percentage of transitional spaces that these buildings have in a standard floor plan. The relationship between these transition al spaces and the indoor areas will also be considered in this study. Estimates are made of the energy-saving potential based on different commercial buildings located in the climate of the Barcelona area in Spain. Alonso, C. [et al.]. Potential for energy saving in transitional spaces in commercial buildings. A: International Conference CleanTech for Sustainable Building. "CLEANTEH FOR SUSTAINABLE BUILDINGS - FROM NANO TO URBAN SCALE". Lausanne: 2011, p. 547-552.